Excel2R imports Microsoft Excel spreadsheets into Revit® projects, including style settings. Tables are easily created and kept current because data are linked. This significantly speeds up project documentation. 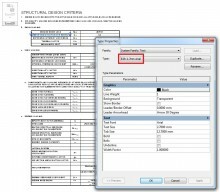 Excel2R imports MS Excel Spreadsheets to Revit Projects with it Design Settings. Such data can be synchronized with the original MS Excel spreadsheet at any time. Use Excel2R when you need to quickly insert MS Excel data into your Revit Architecture, Revit MEP and Revit Structure projects. The Excel2R plug-in keeps a strong link between MS Excel and Revit project. Keeps MS Excel settings: Cell width/height; Text size/font/style per cell; Alignment within the cell; Merged cell; etc. 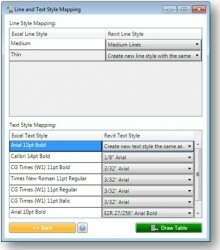 Has a possibility to map Text and Line Styles between MS Excel and Revit project. Informs user when the MS Excel file was modified and will be updated in Revit project. Time-saving productivity when you link MS Excel information to Revit project. Always Up-to-Date the latest data in Revit project. - Freddie Kleiner, IT/Drafter at TJP Engineering, USA. Our company develops Excel schedules far ahead of our model design, so it is necessary for us to include those schedules with our Revit projects. In the past, we would use AutoCAD and its datalinks to export a CAD file that we would import to Revit which was met with all kinds of inconsistent and bewildering results. Now we can with the push of a button update our schedules, and even at a glance see which schedules are out of date. Beyond that, AGACAD’s support is amazing. We encountered a formatting/display issue which we informed them of, and in a very short period of time, the issue was resolved in the next version of the software. I haven’t experienced anything like that with any other software company. Incredibly satisfied! - P. Todd Thongeiam, CDT, Architectural Designer at Stir Architecture (formerly Altoon Partners), USA. - Chester L. Morgan III, HVAC/Plumbing Designer at Air Masters Corporation, United States. "It’s very easy to use and helps me get what I need quickly. Everything is working perfectly on the formatting. Great job to your team! Thank you for taking the time to look into the issue I was having and make adjustments needed. Thank you for all the wonderful support." - Julian Phoon, BIM Manager at NDY (Malaysia) Sdn Bhd, Malaysia. - William Fletcher’s, Engineering Technician at O’Brine & Gere, response after the release of Excel2R new version 2015.2, USA. "I appreciate you addressing my specific issue. I think it will greatly improve your already slick product." - Doug Mahoney, BIM/CAD Leader at KPFF Consulting Engineers, USA. - Donovan Young, CEO and Architect at Donovan Young Architecture, South Africa. "The software works fantastically. I really cannot go without it."